Americans are in love with the magic and mystery of Ireland. Every March, Saint Patrick's Day greeting cards and green milkshakes become bestsellers. Leprechauns decorate cereal boxes in our grocery stores. Four-leaf clovers and pots of gold at the end of the rainbow fuel our collective imagination. Celtic knotwork motifs adorn our jewelry, clothing, and even our skin, as tattoos. And last, but not least, knitters and non-knitters alike have a never-ending love affair with cable-knit sweaters from the Aran Islands, the kind my grandmother, Ruth, used to call "Irish pattern sweaters." Mystery and misinformation surround the history of Aran-style knitting, named for a trio of small islands in the west of Ireland. Some basic questions need to be asked to understand the iconic garment, the "Aran sweater." What is it? When did it originate? And how did it begin? These questions are all complicated and the answers are murky. The style has also evolved and been interpreted in different ways over the years, for both commercial and artistic reasons. At its simplest, an Aran sweater is a heavily textured garment, decorated with combinations of stitch patterns that most often emphasize intricate cable patterning, sometimes also embellished with bobbles, and frequently worked in creamy or white yarn. This type of patterning, especially when constructed in a natural white, brings the word "Aran" to the experienced knitter's consciousness. That said, similar patterning worked in yarns of other colors is equally "Aran," although certainly cables and bobbles show up best in the light-colored yarns that are most readily associated with the tradition. The style originated in the early twentieth century as a localized interpretation of the fisherman's gansey. This much we do know. How it began brings up many theories and stories. Much of the misinformation has arisen through the efforts of Heinz Edward Kiewe, a twentieth-century master of recognizing a fine thing and marketing the heck out of it. His contribution includes the development of a mythology about the sources of Aran knitting and the meanings of its patterns. Kiewe did the world a great service by bringing the Aran sweater to its attention, but finding its real roots takes more than creative imagination -- and may not, in fact, be entirely possible. While proficient knitting was well established in the Aran Islands before this type of garment appeared, the interactions between knitters that resulted in the development of this distinctive style have not been completely determined. Alice Starmore has gathered and evaluated a lot of material relating to the- style's origins in her classic book Aran Knitting. Several writers on the topic, including Starmore, have discussed what some of them call the "American connection." 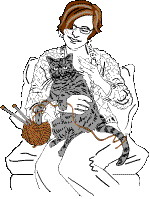 In A History of Handknitting and in Irish Knitting, respectively, authors Richard Rutt and Rohanna Darlington both relate a story about a woman from the Aran Islands who spent some time near Boston, Massachusetts, where she reportedly learned to knit cables from an immigrant from another part of Europe, then brought the techniques back to Ireland and shared them with her neighbors. In The Aran Sweater, Deirdre McQuillan shares a different version of the story, where the woman visiting America saw blue fisherman's sweaters in a shop window, copied the designs in her own knitting, and embellished the idea further by creating new cables based on plants found near her Irish home. Without question, Aran-style sweaters have been important both in Ireland and in North America, and both culturally and artistically. Whether the style began with a spark struck in the United States that was transported back to Ireland or the lantern was lit entirely on Irish soil, the connections are strong. Between the 1820s and the 1920s, several waves of emigration to the United States brought large numbers of people west across the Atlantic in search of jobs or, sometimes, simply more food than was available in Ireland. These Irish American immigrants kept strong ties to their homeland that passed down through generations, and those relationships swirl around the history of Aran knitting. The flow goes both directions, and it affects many art forms. "There are traditions that have built up around Irish-America that are actually Irish American and are not actually Irish," Deirdre Thornton, an Irish blogger, explains in her Aran Knitting FAQ. "For a long time Ireland was very dependent on Irish Americans for money and maintaining some illusions were in many ways more important than the truth and while both cultures have roots in the same source there have been different growth and in ways it has been quite different." "To the Irish diaspora in North America, these sweaters were indeed powerful symbols of loss," designer Kate Davies wrote on her blog, "in the imagined sense of a lost identity: old family connections, tribal belongings, a national heritage, the sense of place." The almost magically complex interlacing patterning of Aran designs -- formed, as always in the craft, with variations on just the two stitches, the knit and the purl -- carry some of those senses that Kate Davies speaks of not only to Irish knitters but, somehow, to all knitters: a sense of identity and tribal belonging seems to arise from the forms of the crossing stitches and the high-relief of the bobbles. Perhaps this sense of loss and deeper meaning is why my grandmother, an Eastern-European Jew living in America, felt such a strong compulsion to knit Aran sweaters. Whatever their source, the sweaters began to be knitted at about the time of the last big wave of Irish emigration to North America. In Ireland itself, Aran-style sweaters first appeared in the early decades of the twentieth century when local knitters modified traditional fisherman's guernseys by making them more elaborate and more densely textured. In 1936, Heinz Kiewe discovered the one that inspired him in a shop in Dublin. Obviously, if the garment had made it to Dublin and was sufficiently realized to catch Kiewe's eye so effectively, someone had been knitting items of this type for a while. Intricacy at this level doesn't get invented overnight. Twenty years later, in 1956, the style began to make a significant impact on the American knitting scene, when Woman's Day published a booklet of Hand Knits from the Aran Islands. Perhaps the first Aran patterns published in the United States, this collection included instructions to make a slipover (pullover), coat, socks, and "two-finger" mittens (shooting gloves). The materials called for undyed wool yarn from the Norwegian company Rygja and suggested using a toothpick to hold the moving stitches while working the cable crossings! The patterns were not charted, but each project was accompanied by a small diagram showing the layout of stitches on the knitted pieces. Sadly, the designer was not credited, so we may never know whether these beautiful sweaters were designed by an Irish or an American knitter. 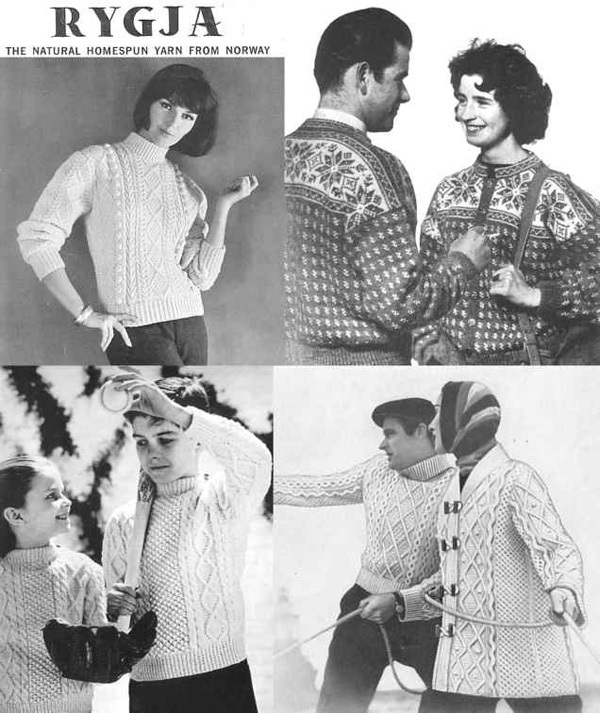 Probably the most influential person in bringing the Aran sweater into popularity in the United States was Elizabeth Zimmermann, who knit a man's pullover decorated with diamond and staghorn cables for Vogue Knitting in 1958. It would be an understatement to say that she was quite unhappy when she discovered that her pattern, written for construction in the round, had been rewritten by the publisher for flat knitting! The original Aran sweaters were, indeed, knitted in the round, but the construction was changed to flat knitting later when the garments were produced for commercial markets and flat-knitted pieces could more easily be adapted to multiple sizes. This eventually also led to a change from a design with a strap or saddle-shoulder construction, which allowed a cable motif to be carried all the way from sleeve cuff to neckline, to other types of shoulder shaping, including drop-shoulder, raglan, and set-in sleeves. When my grandmother was knitting sweaters for me, I always complained that the sweaters were too small. "You're a slender girl," she would say, "and I made a woman's size 12. You can't need a bigger size than that." It wasn't until I came back to knitting years later that I realized the sweaters she made were shaped with very high sleeve caps, set into very small armholes, which was the fashion of the day. At the time, I was more comfortable in oversized drop-shoulder sweaters. Today, fitted sweaters are back in style, but I still don't like tight-fitting sleeves and armholes. I've designed my version of my Grandma Ruth's Irish pattern sweater with some simple armhole and sleeve-cap shaping to eliminate underarm bulk, and with a saddle shoulder so one of the cable motifs can make a traditional journey all the way up to the neckline. I've also added waist shaping, hidden in the reverse stockinette stitch sections between the cables, for a flattering outline. If you prefer a less fitted body, just skip the waist decreases and increases. Converting this to a unisex sweater for men can be accomplished in the same way, and the armhole and sleeve-cap shaping can be eliminated as well. To convert to a unisex drop-shoulder construction, simply knit the body straight up and continue to increase on the sleeves until they are the full length to the shoulder. 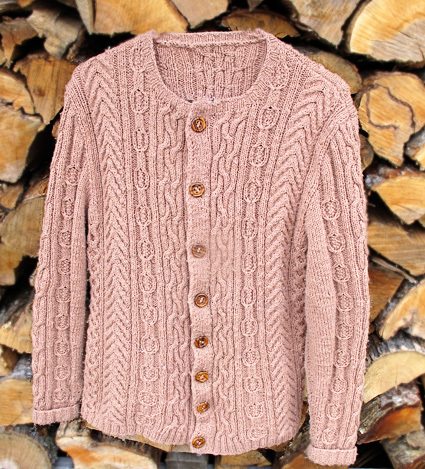 This cardigan is based on the designs my grandmother made in the 1970s using two of my favorite cable stitches: honeycomb and hollow oak. The first I learned from my grandmother when I was a girl, and the second I learned from the owner of my local yarn shop after I returned to knitting in my mid-thirties. Saddle shoulders give a nod to tradition and waist shaping -- worked in the purl columns between the cable motifs -- updates the silhouette with a contemporary fit. The sweater is worked back and forth in pieces, with no cable twists worked on wrong-side rows. 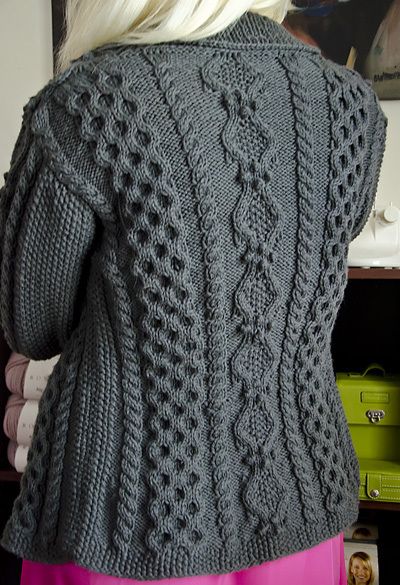 The grey color of the yarn and the stone buttons remind me of the shade cast by clouds on the rocky cliffs of the Aran Islands. Note: To create an easy fit, the fronts when buttoned together are wider than the back. See schematic for detailed measurements (please note that schematic does not include buttonbands). 16 sts/28 rows = 4 inches in Reverse Stockinette stitch with larger needles, blocked. Work armhole decreases using k2tog or p2tog as needed to maintain seed stitch pattern. When all seed st stitches have been decreased, work all decreases as p2tog. When working decreases at neck, maintain pattern wherever possible. If maintaining a cable pattern becomes impossible, simply work all knit sts as knit and purl sts as purl. Row 1 [RS]: K1, (p1, k1) across. Always knit the purl sts and purl the knit sts from the previous row. Row 1 [RS]: (P1, k1) across. Row 2 [WS]: (K1, p1) across. C4B: Sl 2 sts to cn and hold in back, k2; k2 from cn. C4F: Sl 2 sts to cn and hold in front, k2; k2 from cn. C3BP: Sl 1 st to cn and hold in back, k2; p1 from cn. C3FP: Sl 2 sts to cn and hold in front, p1; k2 from cn. Bobble: (K1, p1, k1, p1, k1) into the next st. Turn, p5, turn, k5, turn, p5, turn. Sl 3 sts together k-wise, k2tog, pass all 3 slipped sts over. M1P: Insert left needle, from back to front, under strand of yarn which runs between last stitch on left needle and first stitch on right needle; purl this stitch through back loop. With smaller needles, CO 71[77, 83, 89, 97, 105, 113] sts. Work in Seed St for 7 rows. Increase row [WS]: Seed st 11[14, 9, 12, 13, 14, 15], (pfb twice, seed st 0[0, 6, 6, 7, 8, 9]) 0[0, 1, 1, 1, 1, 1] time, pfb twice, seed st 4, pfb twice, seed st 6[6, 6, 6, 7, 8, 9], pfb twice, seed st 8[8, 8, 8, 9, 10, 11], pfb twice, seed st 7[7, 7, 7, 8, 9, 10], pfb twice, seed st 6[6, 6, 6, 7, 8, 9], pfb twice, seed st 4, pfb twice, (seed st 0[0, 6, 6, 7, 8, 9], pfb twice) 0[0, 1, 1, 1, 1, 1] time, seed st 11[14, 9, 12, 13, 14, 15]. 85[91, 101, 107, 115, 123, 131] sts. Row 1 [RS]: Seed st 5[8, 5, 8, 8, 8, 8], p4[4, 4, 4, 5, 6, 7], (work Row 1 of Right Rope Cable, p0[0, 4, 4, 5, 6, 7]) 0[0, 1, 1, 1, 1, 1] time, work Row 1 of Honeycomb Cable, p4[4, 4, 4, 5, 6, 7], work Row 1 of Left Rope Cable, p4[4, 4, 4, 5, 6, 7], work Row 1 of Hollow Oak Cable, p4[4, 4, 4, 5, 6, 7], work Row 1 of Right Rope Cable, p4[4, 4, 4, 5, 6, 7], work Row 1 of Honeycomb Cable, (p0[0, 4, 4, 5, 6, 7]) work Row 1 of Left Rope Cable) 0[0, 1, 1, 1, 1, 1] time, p4 [4, 4, 4, 5, 6, 7], seed st 5[8, 5, 8, 8, 8, 8]. Row 2 [WS]: Seed st 5[8, 5, 8, 8, 8, 8], k4[4, 4, 4, 5, 6, 7], (work Row 2 of Left Rope Cable, k0[0, 4, 4, 5, 6, 7]) 0[0, 1, 1, 1, 1, 1] time, work Row 2 of Honeycomb Cable, k4[4, 4, 4, 5, 6, 7], work Row 2 of Right Rope Cable, k4[4, 4, 4, 5, 6, 7], work Row 1 of Hollow Oak Cable, k4[4, 4, 4, 5, 6, 7], work Row 2 of Left Rope Cable, k4[4, 4, 4, 5, 6, 7], work Row 2 of Honeycomb Cable, (k0[0, 4, 4, 5, 6, 7], work Row 2 of Right Rope Cable) 0[0, 1, 1, 1, 1, 1] time, k4[4, 4, 4, 5, 6, 7], seed st 5[8, 5, 8, 8, 8, 8]. Continue working charts, seed st, and reverse stockinette st as established until piece measures approx. 4 inches from cast on, ending after a WS row. Decrease row [RS]: Seed st 5[8, 5, 8, 8, 8, 8], (p2tog, purl to next cable panel, work next cable panel as established), 3[3, 4, 4, 4, 4, 4] times, (purl to 2 sts before next cable panel, p2tog, work next cable panel as est), 2[2, 3, 3, 3, 3, 3] times, purl to last 7[10, 7, 10, 10, 10, 10] sts, p2tog, seed st to end. 79[85, 93, 99, 107, 115, 123] sts. 6[6, 8, 8, 8, 8, 8] sts decreased. Work even in patt for approx. 4 inches more, ending after a WS row. Rep Decrease Row once more. Piece measures approx. 8 inches from CO edge. 73[79, 85, 91, 99, 107, 115] sts rem. Work even for approx. 4 inches, ending after a WS row. Increase row [RS]: Seed st 5[8, 5, 8, 8, 8, 8], (M1P, purl to next cable panel, work next cable panel as established), 3[3, 4, 4, 4, 4, 4] times, (purl to next cable panel, M1P, work next cable panel as established), 2[2, 3, 3, 3, 3, 3] times, purl to last 5[8, 5, 8, 8, 8, 8] sts, M1P, seed st to end. 79[85, 93, 99, 107, 115, 123] sts. 6[6, 8, 8, 8, 8, 8] sts increased. Rep Increase Row once more. Piece measures approx. 16 inches from CO edge. 85[91, 101, 107, 115, 123, 131] sts. Work 1 WS row even in patt, or work until piece measures desired length to armhole, ending after a WS row. Next row [RS]: Dec 1, patt to last 2 sts, dec 1. 83[89, 99, 105, 113, 121, 129] sts. 2 sts decreased. Next row [WS]: Work even in patt as est. Repeat last two rows 3[4, 6, 6, 8, 10, 12] times more. 77[81, 87, 93, 97, 101, 105] sts. 6[8, 12, 12, 16, 20, 24] sts decreased. Work even in patt as established until armhole measures 6[6.5, 7, 7.25, 7.75, 8.25, 8.75] inches, ending after a WS row. With smaller needles, CO 44[47, 50, 53, 58, 63, 68] sts. Row 1 [RS]: P1, work in seed st to end. Row 2 [WS]: Work seed st to last st, k1. Rep Rows 1-2 twice more, then rep Row 1 once more. Increase row [WS]: Seed st 11[14, 9, 12, 13, 14, 15], pfb twice, (seed st 0[0, 6, 6, 7, 8, 9], pfb twice) 0[0, 1, 1, 1, 1, 1] time, seed st 4, pfb twice, seed st 6[6, 6, 6, 7, 8, 9], pfb twice, seed st 8[8, 8, 8, 9, 10, 11], pfb twice, seed st 7[7, 7, 7, 8, 9, 10]. 52[55, 60, 63, 68, 73, 78] sts. 8[8, 10, 10, 10, 10, 10] sts increased. Row 1 [RS]: P4[4, 4, 4, 5, 6, 7], work Row 1 of Hollow Oak Cable, p4[4, 4, 4, 5, 6, 7], work Row 1 of Right Rope Cable, p4[4, 4, 4, 5, 6, 7], work Row 1 of Honeycomb Cable, p4[4, 4, 4, 5, 6, 7], (work Row 1 of Left Rope cable, p0[0, 4, 4, 5, 6, 7]) 0[0, 1, 1, 1, 1, 1] time, seed st 5[8, 5, 8, 8, 8, 8]. Row 2 [WS]: Seed st 5[8, 5, 8, 8, 8, 8], (k0[0, 4, 4, 5, 6, 7], work Row 2 of Left Rope cable) 0[0, 1, 1, 1, 1, 1] time, k4[4, 4, 4, 5, 6, 7], work Row 2 of Honeycomb Cable, k4[4, 4, 4, 5, 6, 7], work Row 2 of Right Rope Cable, k4[4, 4, 4, 5, 6, 7], work Row 2 of Hollow Oak Cable, k4[4, 4, 4, 5, 6, 7]. Decrease row [RS]: (Purl to 2 sts before next cable panel, p2tog, work next cable panel as established) 3[3, 4, 4, 4, 4, 4] times, purl to last 7[10, 7, 10, 10, 10, 10] sts, p2tog, seed st to end. 48[51, 55, 58, 63, 68, 73] sts. 4[4, 5, 5, 5, 5, 5] sts decreased. Rep Decrease Row once more. Piece measures approx. 8 inches from CO edge. 44[47, 50, 53, 58, 63, 68] sts. 4[4, 5, 5, 5, 5, 5] sts decreased. Increase row [RS]: (Purl to next cable panel, M1P, work next cable panel as established), 3[3, 4, 4, 4, 4, 4] times, purl to last 5[8, 5, 8, 8, 8, 8], M1P, seed st to end. 48[51, 55, 58, 63, 68, 73] sts. 4[4, 5, 5, 5, 5, 5] sts increased. Rep Increase Row once more. Piece measures approx. 16 inches from CO edge. 52[55, 60, 63, 68, 73, 78] sts. 4[4, 5, 5, 5, 5, 5] sts increased. 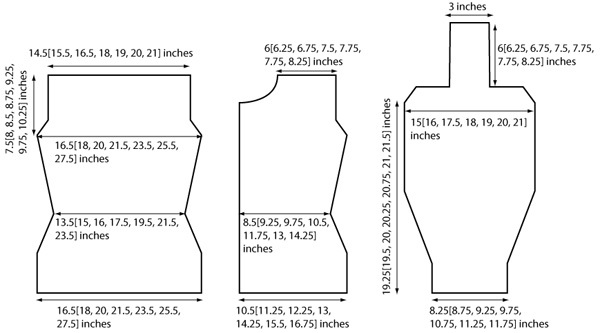 Work 1 WS row even in patt, or work until piece measures same as Back to armhole, ending after a WS row. Next row [RS]: Patt to last 2 sts, dec 1. 51[54, 59, 62, 67, 72, 77] sts. 1 st decreased. Repeat last two rows 3[4, 6, 6, 8, 10, 12] times more. 48[50, 53, 56, 59, 62, 65] sts. 3[4, 6, 6, 8, 10, 12] sts decreased. Work even until armhole measures 3.5[4, 5, 5, 5.5, 5.5, 6] inches, ending after a WS row. Note: Slip the first stitch at beg of each bind-off for a smoother curve on the neck edge, making it easier to pick up sts for the collar. Cont in patt, binding off 5[5, 6, 7, 8, 8, 8] sts at beg of next RS row, 4[4, 4, 3, 4, 4, 4] sts at beg of foll RS row, then 2[2, 2, 2, 2, 3, 3] sts at beg of foll 2[3, 3, 3, 3, 3, 3] RS rows. Dec 1 st at neck edge on every foll RS row 4[3, 2, 2, 2, 2, 2] times. 31[32, 35, 38, 39, 39, 42] sts rem. Work even until piece measures same as Back to shoulder. Row 1 [RS]: Work in seed st to last st, p1. Row 2 [WS]: K1, work seed st to end. Increase row [WS]: Seed st 7[7, 7, 7, 8, 9, 10], pfb twice, seed st 8[8, 8, 8, 9, 10, 11], pfb twice, seed st 6[6, 6, 6, 7, 8, 9], pfb twice, seed st 4, (pfb twice, seed st 0[0, 6, 6, 7, 8, 9]) 0[0, 1, 1, 1, 1, 1] time, pfb twice, seed st 11[14, 9, 12, 13, 14, 15]. 52[55, 60, 63, 68, 73, 78] sts. 8[8, 10, 10, 10, 10, 10] sts increased. Row 1 [RS]: Seed st 5[8, 5, 8, 8, 8, 8], (p0[0, 4, 4, 5, 6, 7], work Row 1 of Left Rope cable) 0[0, 1, 1, 1, 1, 1] time, p4[4, 4, 4, 5, 6, 7], work Row 1 of Honeycomb Cable, p4[4, 4, 4, 5, 6, 7], work Row 1 of Right Rope Cable, p4[4, 4, 4, 5, 6, 7], work Row 1 of Hollow Oak Cable, p4[4, 4, 4, 5, 6, 7]. Row 2 [WS]: K4[4, 4, 4, 5, 6, 7], work Row 2 of Hollow Oak Cable, k4[4, 4, 4, 5, 6, 7], work Row 2 of Right Rope Cable, k4[4, 4, 4, 5, 6, 7], work Row 2 of Honeycomb Cable, k4[4, 4, 4, 5, 6, 7], (work Row 2 of Left Rope cable, k0[0, 4, 4, 5, 6, 7]) 0[0, 1, 1, 1, 1, 1] time, seed st 5[8, 5, 8, 8, 8, 8]. Decrease row [RS]: Seed st 5[8, 5, 8, 8, 8, 8], (p2tog, purl to next cable panel, work next cable panel as established) 3[3, 4, 4, 4, 4, 4] times, p2tog, purl to end. 48[51, 55, 58, 63, 68, 73]. 4[4, 5, 5, 5, 5, 5] sts decreased. Next row [RS]: Dec 1, patt to end. 51[54, 59, 62, 67, 72, 77] sts. 1 st decreased. Work until armhole measures 3.5[4, 5, 5, 5.5, 5.5, 6] inches, ending after a RS row. 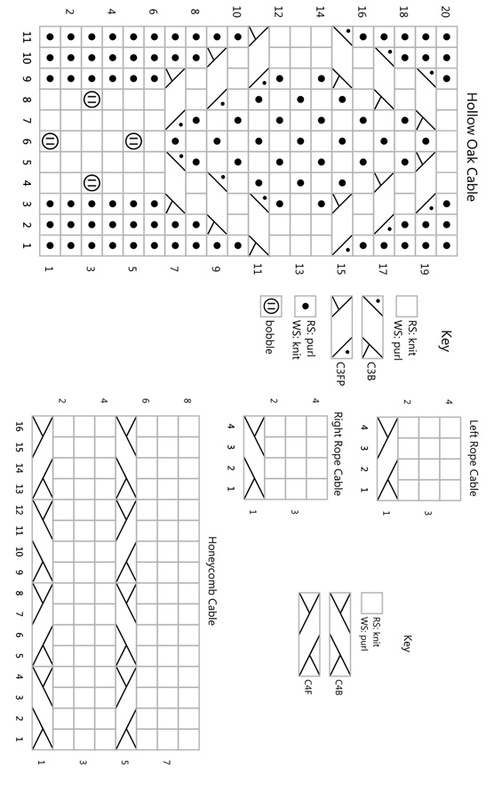 Cont in patt, binding off 5[5, 6, 7, 8, 8, 8] sts at beg of next WS row, 4[4, 4, 3, 4, 4, 4] sts at beg of foll WS row, then 2[2, 2, 2, 2, 3, 3] sts at beg of foll 2[3, 3, 3, 3, 3, 3] WS rows. Dec 1 st at neck edge on every foll RS row 4[3, 2, 2, 2, 2, 2] times. 31[32, 35, 38, 39, 39, 42] sts rem. With smaller needles, CO 33[35, 37, 39, 43, 45, 47] sts. Row 1 [RS]: K1, seed st to last st, k1. Row 2 [WS]: P1, seed st to last st, p1. Continue to work in seed st with St st edge sts as established for 3 inches, ending after a RS row. Increase Row [WS]: P1, seed st 5[6, 7, 8, 10, 11, 12], pfb twice, seed st 8, pfb twice, seed st 7, pfb twice, seed st 5[6, 7, 8, 10, 11, 12], p1. 39[41, 43, 45, 49, 51, 53] sts. 6 sts increased. Note: Read ahead! Stitch pattern directions and shaping directions areÂ worked at the same time. Row 1 [RS]: K1, seed st 2[3, 3, 4, 6, 7, 8], p3[3, 4, 4, 4, 4, 4], work Row 1 of Left Rope Cable, p4, work Row 1 of Hollow Oak Cable, p4, work Row 1 of Right Rope Cable, p3[3, 4, 4, 4, 4, 4], seed st 2[3, 3, 4, 6, 7, 8], k1. Row 2 [WS]: P1, seed st 2[3, 3, 4, 6, 7, 8], k3[3, 4, 4, 4, 4], work Row 2 of Right Rope Cable, p4, work Row 2 of Hollow Oak Cable, p4, work Row 2 of Left Rope Cable, p3[3, 4, 4, 4, 4, 4], seed st 2[3, 3, 4, 6, 7, 8], p1. Cont in chart patt as set, AT THE SAME TIME, inc at each end of 3rd row and then every foll 4th row 12[13, 15, 15, 15, 16, 17] times more, working increases inside edge sts and into seed st pattern. 65[69, 75, 77, 81, 85, 89] sts. 26[28, 32, 32, 32, 34, 38] sts increased. Work even in patt until sleeve measures 19.25[19.5, 20, 20.25, 20.75, 21, 21.5] inches from cast on, ending after a WS row. Next row [RS]: K1, dec 1, patt to last 3 sts, dec 1, k1. 63[67, 73, 75, 79, 83, 87] sts. 2 sts decreased. Next row [WS]: Work even in patt as established. Repeat last two rows 3[4, 6, 6, 8, 10, 12] times more. 57[59, 61, 63, 63, 63, 65] sts. 6[8, 12, 12, 16, 20, 24] sts decreased. Work even in patt until length of saddle measures 6[6.25, 6.75, 7.5, 7.75, 7.75, 8.25] inches long. Block all pieces. Using mattress stitch, sew front and back shoulders to sides of saddle. Sew front and back armholes to sleeve cap. Sew side seams and underarm seams. Mark button placement be placing a pin or removable marker in the buttonband 0.5 inch above the hem, 0.5 inch below the neck edge, then 4 more pins/markers evenly spaced in-between. Work in Seed st for 0.75 inches. Next row [RS]: *Patt to marker, yo, dec 1; rep from * five times more, patt to end of row. Next row [WS]: Work in pattern, working yo as knit or purl as needed to maintain seed st patt. Continue in seed st until buttonhole band measures 1.5 inches. Note: The collar will fold down, so the RS of the collar is the WS of the body. With WS facing and smaller needles, starting at center of buttonband, pick up and knit 1 st for every 2 rows of buttonband, 1 st in each cast off st, approx. 1 st for every 2 rows to back neck, 1 st for every cast off st across back neck, approx. 1 st for every 2 rows to right neck bind offs, 1 st in every cast off st to buttonhole band, and 1 st for every 2 rows of buttonhold band. Adjust total stitch count so that you have an odd numbers of sts. Row 1 [RS]: P1, (k1, p1) across. Row 2 [WS]: (K1, p1) to last st, k1. Rep Rows 1-2 until collar measures 4 inches from picked up sts. Change to larger needles and work in established rib for 2.5 inches more, ending after a WS row. Next row [RS]: Rib 5, yo, k2tog, rib to last 7 sts, yo, k2tog, rib 5. BO loosely in patt. Fold collar to outside. Sew buttons on buttonband opposite buttonholes. 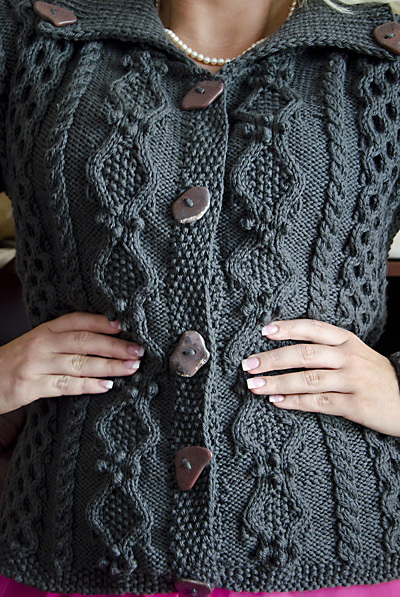 Sew buttons on body of sweater matching location of buttonholes on collar. Button collar in place.